Here is the best step by step guide showing how schools can set up an organic food garden. This book is packed with brilliant, practical suggestions for establishing and maintaining an inexpensive Seed Saver garden. Schools are currently eligible for government grants to help establish organic food gardens, and by using this guide, success can be yours. 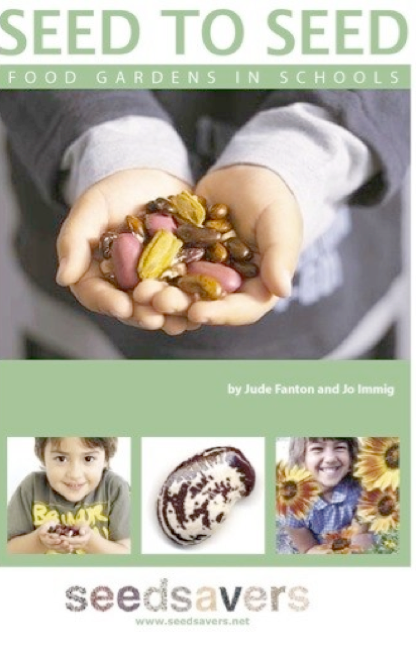 * Jude Fanton is a co-founder of Seed Savers, an inspiring gardener and educator who confesses that she is a “long-time dreamer of food gardens in schools”. This easy to read, simple to follow and engagingly illustrated book is based on the authors’ many years work with edible gardens and children in a learning environment. This book grew out of the creation of a food garden at Byron Bay Public School. Photos of that process illustrate the book, along with stimulating black and white drawings throughout by Dr Liz Elliott. You can buy a hard copy from Seed Savers in black and white with a coloured cover for only $20.00 post paid, or for free as a full colour downloadable pdf from our website, http://www.seedsavers.net. Seed Savers’ invites you to pass news of this publication on to anyone that would like their children to learn about growing health-giving food at school or in a community garden.